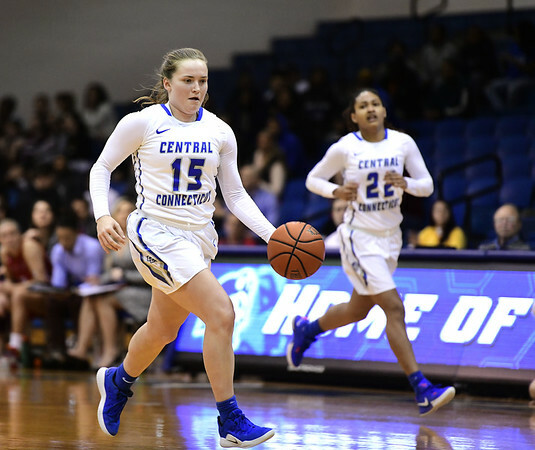 SMITHFIELD, R.I. - The struggles to come up with a win continued for the Central Connecticut State women’s basketball team on Saturday. Despite getting a career-high 19 points from sophomore Emma McCamus, the Blue Devils fell to Bryant on the road 72-60. CCSU (4-13, 1-6 Northeast Conference) has now lost eight of its last nine games. Kiana Patterson was the only other player to hit double-digits for the Blue Devils with 16 points, shooting 7-19 (36.8 percent) from the field. It was a tough game from the start for CCSU. The Bulldogs went on a 11-2 run in the first quarter, holding the Blue Devils scoreless for over two minutes. Baskets by Patterson and McCamus kept CCSU in the game, but the Blue Devils trailed 25-12 at the end of the first. After the first 20 minutes of play, the Blue Devils shot 25.6 percent (10-39) from the floor including 25 percent (2-8) from beyond the arc. CCSU also shot 85.7 percent from the foul line. Bryant shot 46.9 percent (15-31) and 28.6 percent (2-7) from deep. Patterson started to find a rhythm in the third quarter for the Blue Devils, scoring 10 of the team’s 12 points as CCSU trailed 52-40 with 10 minutes left to play. The Blue Devils went on a 9-2 run to open the final quarter. A jumper by Patterson cut the lead to 54-49 with 6:43 to play. CCSU then went on a final run with 3s by Patterson and McCamus, but the Bulldogs responded with a 10-0 run pushing the lead back to 14 points. Sydney Holloway led Bryant with 20 points and 11 rebounds, while Hannah Scanlan finished with 17 points and 12 rebounds and Masey Zegariwski added 10 points. CCSU is back at home on Monday at 7 p.m. as it hosts LIU Brooklyn. Posted in Newington Town Crier, CCSU on Sunday, 27 January 2019 13:45. Updated: Sunday, 27 January 2019 13:48. © Copyright 2019, newingtontowncrier.com Newington Town Crier, CT.